Some search for wisdom within the teachings of Jesus. Others study Muhammad or the Torah. Still others, Buddha, Krishna, or Lao Tzu. It's hard to say exactly what wisdom is, but it seems to have something to do with achieving enough understanding of the immutable that one begins to feel comfortable and accepting of its workings. It's also hard to imagine humans have any kind of inside track on wisdom. Just look at our history. And then, look at the faces around you. Today perhaps, they look healthy, well-fed, and bemused. But were they yesterday? Will they be tomorrow? Most of us have our good days. But invariably, more of us are left out of those contented feelings each day than participate. And the inescapable result of that truth is that some, if not many, get hurt, anywhere from unkind vindictive remarks on up to mass murder and suicide. As a change of pace, why not take a look at how another species is handling the stress of existence? Take Dolly, for instance. She's a llama. 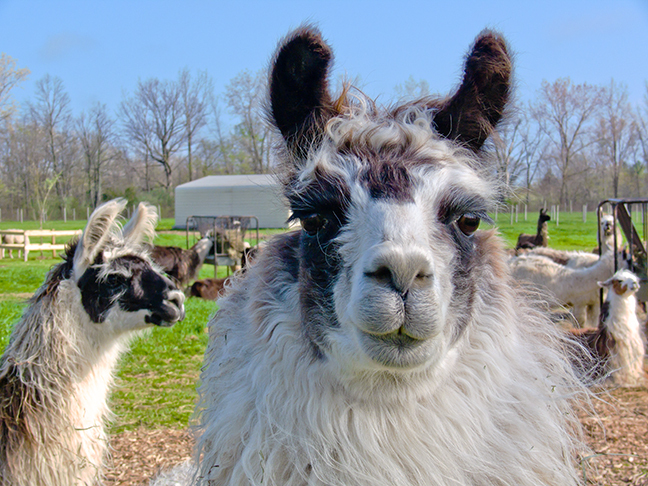 She lives with several other llamas, all female, in a grassy pen stretching several tens of acres across someone's farm in southwest Michigan. The climate is humid compared to her native home in the foothills of the Andes in South America, but the weather in Michigan isn't bad. Perhaps a bit warmer in summer and colder in winter, but not bad. Not much stumbling on rocks trying to climb hills to find better grazing, either. And the humans in her life these days are comparatively easy to get along with. They don't hit or whip and they don't over-burden. Plus, they help with birthing and give a pretty decent haircut each spring. For some reason, not really understood by Dolly, all the cute guy llamas are kept in a different pen. Dolly only gets to see her fave for perhaps a few days at a time every other year. "Keeps the bookkeeping straight", she's heard her caretakers say. "Pedigree, pedigree", whatever that means. Still, it all seems to work out OK. Nobody gets jealous, no spitting or biting each other's ears off, that sort of thing. Lots of room to graze. Supplemental feed. Water. Shelter when it gets really cold. All in all, not a bad life. Now, though it's quite plain to Dolly that she is not totally free to roam wherever and whenever she pleases, she is also quite sure she's found a rather pleasant viable niche for herself. She has friends she feels no need to fight with. Her needs are covered. She isn't bored or constrained or over-burdened or abused. She gets along fine with her caretakers. She really has nothing to complain about. But is there more? Is there something missing from Dolly's life? It's hard to say. But, she certainly shows no signs of worry. Things like: "Why are they watching me, following me around? Are they planning something sinister? Fattening me up for the kill? Or maybe, they're designing experiments on me? Something with radio waves, or radiation, or disgusting debilitating diseases? They could be planning to harvest an organ or two, leaving me with only one eye or half a tongue or no way to pee. Oh, god." No, Dolly doesn't seem worried about such things. She doesn't even seem worried about eating too much or gaining an unbecoming amount of weight or even rising to a bad hair day or getting hay stuck in her teeth. No, she's pretty much worry free. She has more or less come to terms with the immutables surrounding her and found a comfort zone for herself within them. Wouldn't it be interesting if humans took a lesson from Dolly? What if we all followed Dolly's example and tried tuning down all those worries we have, cooperatively rearranging the furniture we all share a bit to make it easier to move around and less stressful to get what we need, and then tried respecting each other's right to exist without encroachment or exploitation? Life lived like that might not be so bad. Dolly seems to like it.